In a fairly light week for distribution lifts, Lowe's, CoreSite Realty, and PG&E added a few coins to their quarterly payouts. 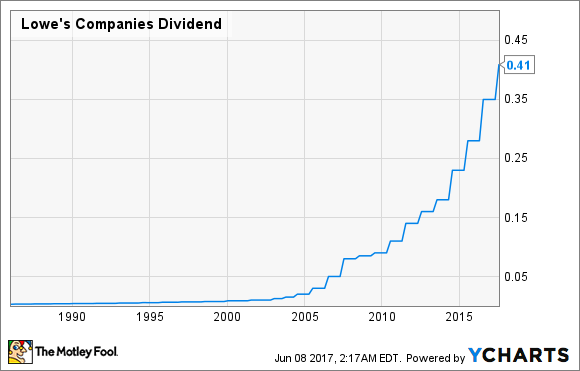 It was bound to happen, and last week it did -- the flood of dividend raises that we've seen so far this year diminished to a trickle. That's not unusual in the fallow periods between earnings seasons, so to some degree, this wasn't a surprise. We'll kick things off with the one stock out of the current trio that's a Dividend Aristocrat (one of the few companies that has raised its dividend at least once annually for a minimum of 25 years in a row): Lowe's (NYSE:LOW) is pumping its quarterly payout 17% higher to $0.41 per share. Although the home improvement chain missed analysts' consensus estimates for its recently reported first quarter (unlike the preceding quarter, which was stellar), the company still posted gains. Same-store sales advanced by just under 2%, and overall sales rose by 11% to almost $17 billion. Adjusted net profit increased by 18% to $1.03 per share. No, that growth wasn't as robust as some might have liked, but the company's operating and free cash flow figures saw big gains in fiscal 2016. Slightly dampening the positive impact of this news is the fact that the company has a habit of spending more than its FCF on dividend payouts and share buybacks. Given its status as an Aristocrat, we could probably give Lowe's the benefit of the doubt and count on it to find the scratch for future raises. If I were a shareholder, though, I'd worry about that tendency to overspend. Lowe's enhanced dividend is to be paid on Aug. 9 to stockholders of record as of July 26. At the most recent closing share price, it would yield 2.1%. 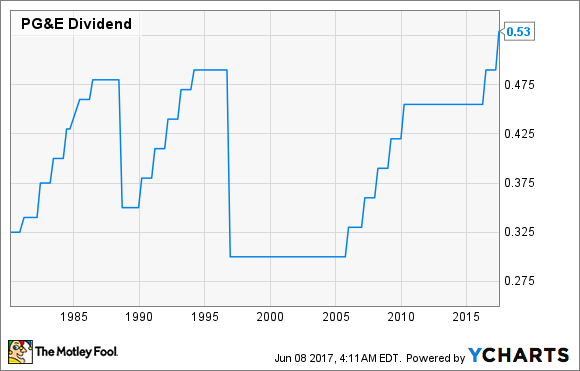 That's slightly higher than the 1.9% average of dividend-paying stocks on the S&P 500. Specialty real estate investment trust CoreSite Realty (NYSE:COR) has declared that its next distribution will be $0.90 per share, exceeding the previous one by almost 13%. The REIT's specialty is data centers, which is a fine business now since the need for such facilities is growing robustly. That's a big reason why CoreSite Realty's revenue grew by a very strong 24% on a year-over-year basis in its Q1 (to nearly $115 million), with funds from operations -- the most important profitability metric for REITs -- rising by an even more impressive 32% to $54 million. There seems to be much more growth where that came from. The REIT also upped its profitability and FFO guidance for its fiscal 2017. For the latter, it now believes it will post $4.35 to $4.45 per share, which is well above the fiscal 2016 result of $3.71. CoreSite Realty habitually keeps its dividend distributions below its FFO figure. I don't see that changing anytime soon, if ever, so I'd rate this payout as very safe -- particularly considering that the data center segment clearly still has plenty of growth ahead of it. CoreSite Realty will distribute its next payout on July 17 to investors of record as of June 30. It would yield 3.4% at the current stock price. Northern California-based utility holding company PG&E (NYSE:PCG) has upped the wattage slightly on its quarterly dividend, bumping it by 4% to $0.53 per share. That's understandable, given that PG&E is coming off a pretty good quarter. The company's Q1 featured a top line that grew by 7% on a year-over-year basis to $4.27 billion, helped greatly by a 43% improvement in its natural gas segment (which, alas, is by far the smaller of its two revenue categories, behind electricity). Better, adjusted net income swelled by 34% to $544 million, or $1.06 per share. Those results trounced analysts' average estimates of $4.16 billion for revenue and $0.81 per share of profit. That EPS beat, by the way, came after several quarters of misses. Although PG&E's operating cash flow has risen encouragingly over the past few years, it is free cash flow negative due to its high capital expenditures. That dynamic surely affects the dividend, which has risen, fallen, and flattened somewhat erratically over the years. 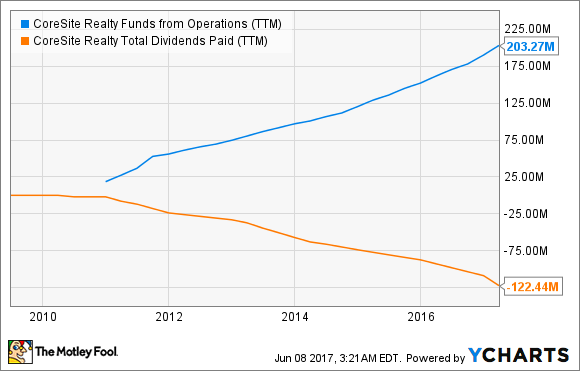 There are more stable dividend-paying utilities out there, so I'd say this stock isn't an ideal pick for income investors. PG&E's new dividend is to be dispensed on July 15 to shareholders of record as of June 30. It would yield 3.1% on the latest closing stock price.